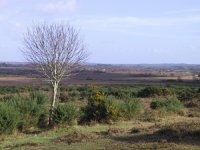 We are ten minutes walk from the local mainline railway station with regular service to Southampton, Bournemouth and London Waterloo. Click here for a map or here for an aerial photo. 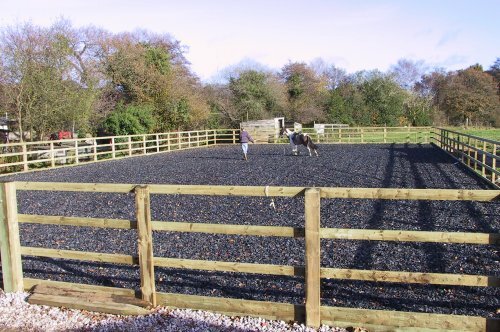 We cater for both the novice and experienced rider in small groups with people of similar ability and we can also offer private and semi private lessons and rides. Instruction is available from our team of instructors. We also hold regular childrens club on Saturdays from £26 and special days during the holiday for children from £50. All riding must be booked in advance. 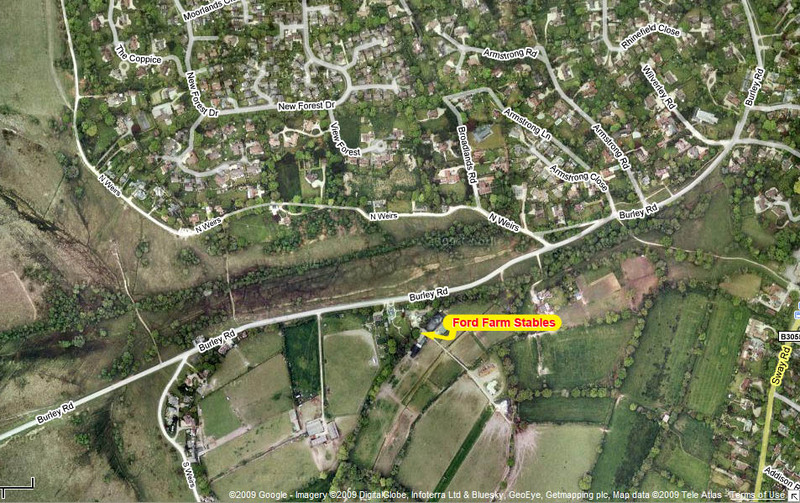 Grass Livery £49 per week, in winter to include ad lib forage at cost or £35 per week in summer. 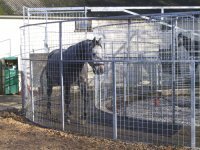 DIY Livery from £35 per week to include box and free use of outdoor arena. Half Liveries from £119.00 per week. Full Liveries from £184.00 per week. Livery Charges exempt from VAT. In the summer, for ponies at grass, it is not normally necessary to offer supplementary feed. In the winter they are fed ad lib big bale forage at cost. If owners wish to feed concentrates, we ask them to do this outside the field. Ponies are usually in groups of 8 � 12. Half livery is another option we offer. 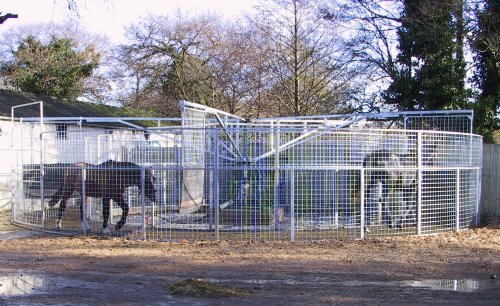 The horses are mainly kept in at night during the winter and by day during the summer. Some horses need to be in at night all year. We muck out, feed, hay and turnout your horse and you just need to groom and ride it. Full livery. We still have a number of full liveries for the busy owner. We have your horse ready to ride when you arrive and we look after everything when you return. We can also transport your horse to local meets, shows etc. General collection and delivery also arranged. Plaiting, Clipping and Trimming by arrangement except for Full Liveries where it is all included in the price if required. Holiday Liveries are now always stabled and costs are £20 for the first night and therafter £15 for subsequent nights. We can also muck out for you for £10 per day if you want a complete holiday. Lorry elecric hook ups available. 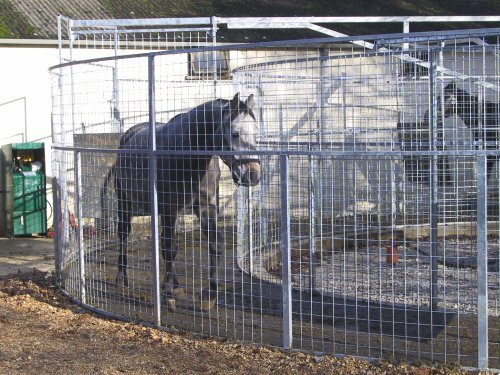 Our popular all weather arena and horsewalker are both available for use by clients and others. Ideal for veterinary referrals, recuperating animals and as an aid to maintaining fitness especially during the winter months. 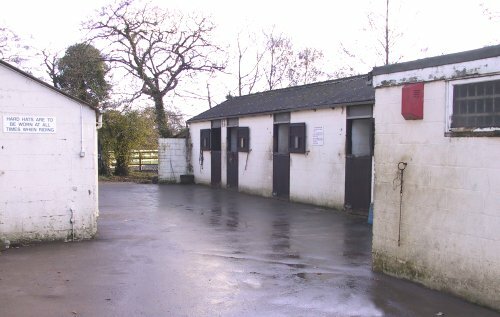 New Indoor School with internal stabling. 40 metres x 20 metres Martin Collins Ecotrack Surface. Usually a good selection from the Brock and Trenley prize winning herds. Foals available from quality mares to make excellent riding ponies at very reasonable prices. Ponies from the Brock herd have won the overall forest bred championships at four of the last five breed shows as well as the supreme championship in 2012. This year, nearly 50% of our runners finished in the first three, we have one or point to point livery vacancies available for the new season. Terms and details available on request. 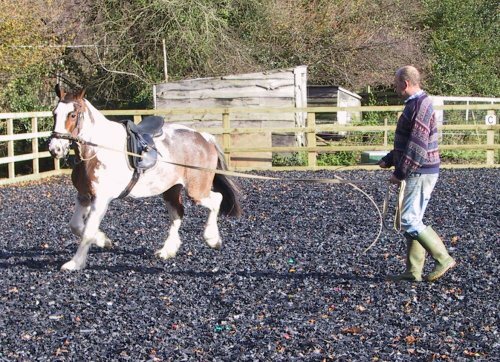 We often have genuine horses and ponies for sale and are able to find suitable animals for livery clients. Our CL opened in September 09 and has been well received and is becoming very popular. It is a flat level site with electric hook ups and some all weather pitches. It is immediately adjacent to the open forest and within walking distance of the village centre. We are open all the year round.